2018 Chevrolet Camaro ZL1 1LE. Photo courtesy Chevrolet.Paddling still works! The division is hoping this will be a win for the Camaro, which has seen sales slide annually since its 2015 redesign; Chevrolet claims that 80 percent of all Camaro sales are automatic. Other comparable high-performance models from Detroit makers, like the Dodge Demon and Ford’s upcoming Shelby GT500, are also automatic-only propositions. For those whose hearts have sunk at the idea of an automatic high-performance Camaro, consider two things. First, it’s an option: It will cost an additional $1,595, on top of the $7,500 ZL1 1LE package. A six-speed manual will still be the default transmission choice. Also, Chevy claims that the automatic offers a half-second improvement over the six-speed stick around its 2.9-mile Milford, Michigan, course. That’s right, the automatic is said to be faster on track. 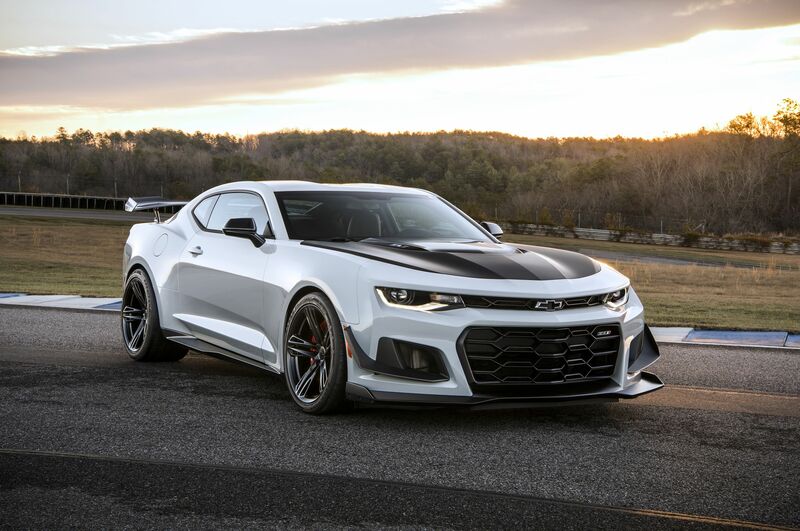 On longer tracks, like the Nürburgring’s 12.9-mile Nordschleife, the automatic Chevy should easily best the 7:16:04 set by a six-speed ZL1 1LE in the summer of 2017. The ZL1 1LE more than just an engine package, although its 650-horsepower LT4 V-8 engine plays a significant part. But the ZL1 1LE sports a carbon-fiber rear wing, plus air deflectors and dive planes on the front fascia to help it stick. Adjustable suspension includes Multimatic DSSV® (Dynamic Suspension Spool Valve) dampers front and rear, with camber plates for completely adjustable front-end height; the rear sway bar offers three-way adjustability. Wider (but smaller-diameter) wheels and Goodyear Eagle F1 Supercar 3R tires offer 10 percent more footprint and 3.3 fewer pounds of unsprung weight per corner. And finally, lighter wheels, a thinner-gauge rear window, and a fixed rear seatback contribute to a 60-pound weight savings.